Against the background of growing concerns about the potential of Islamic extremism in the country, the Senegal government has decided to ban the burqa, the body-and-face-covering dress traditional Muslim women wear. Abdoulaye Daouda, Senegal’s interior minister, said women would no longer be allowed to wear the Islamic dress, which leaves only the eyes exposed. 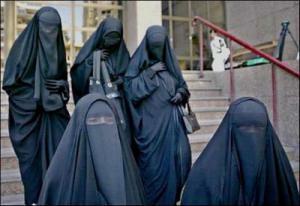 Daouda said the decision was taken out of concern that terrorists might be using the burqa as a disguise. About 92 percent of Senegal’s population is Muslim. The Christian Science Monitor reports that the country has not suffered terrorist attacks, the Senegalese authorities are worried that Islamist groups in the Sahel region, and perhaps even the Nigerian Boko Haram, may be trying to infiltrate Senegal. Last month the police arrested five people suspected of being connected to Boko Haram. In banning the burqa, Senegal is following the example of Chad and Cameroon, two other countries with large Muslim populations, which banned the traditional dress earlier this year. “Senegal is just following the trend,” Martin Ewi, a senior researcher at the Pretoria, South Africa-based Institute for Security Studies, told the Monitor. He said the ban is difficult to enforce, but that it had been reasonably effective in both countries. “You still have the villages and far corners of the country where people don’t always respect the ban,” he added. He warned, though, that the ban was not a foolproof solution. Two days after Chad issued the ban order, two burqa-clad bombers blew themselves up in N’Djamena, killing at least twenty-seven people, including several police officers. “They deliberately wore the burqa to attract the attention of the police,” Ewi said. The question of the burqa, and how to balance traditional Muslim practices with the requirements of security, have been topics of lively debates in Senegal. “Its imposition in Senegal will cause social instability … there is a delicate line between preventive measures and respect for individual freedoms,” Khadim Mbacke, a Dakar-based researcher, told the Monitor. Mbaye Niang, a Muslim leader in Senegal and member of parliament, said the purpose of the ban was designed to protect Islam. “We should not allow someone to cover their entire body like terrorists do. This is a tradition of some countries but it has nothing to do with Islam,” he told the local newspaper Le Quotidien. Farid Essack, a religious studies scholar at the University of Johannesburg, said that the important thing was context, and that the justifications used in Muslim countries may not apply elsewhere. “In some political contexts, I find [the banning of burqas] deeply disturbing and an extension of Islamaphobia. I don’t think that the Chadian response is a manifestation of Islamophobia,” he told the Monitor.